This simple little app will allow you to track the total number of steps you take. Also, based on the number of steps you take it will generate a distance traveled. StormTorch will turn on you screen as well as the led light to its brightest level. 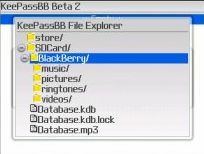 This is simply a password keeper for the BlackBerry, store all you passwords in one place! ExtraLight is a strictly no-frills "flashlight" application. It turns on the status LED to its maximum intensity when you start it and turnings it off when you close it. That's all there is to it. crunchSMS is a chat-style bubble SMS application like those seen on the iPhone and Android phones. It's intuitive, easy to use, and makes texting enjoyable. You can use crunchSMS as a replacement to the built-in Messages application, simply install and use the crunchSMS icon instead. Note: To receive your SMS text messages on crunchSMS and not on your regular SMS Inbox simply do this: Just block incoming SMS messages (crunchSMS will still receive them): go to Options > Security Options > Firewall. Note that you don't need to enable the firewall! PeekABoo enables your BlackBerry camera to shoot 4 times with a silencer on so you can aim and shoot with no worry. This is a very simple, yet handy program. It essential makes it so all you have to do is press the letter 'Q' to Compose an SMS on your BlackBerry, instead of having to click on the SMS icon or going to the menu and going to compose.